Home › Temminck's tragopan › Blyth's tragopan - Tragopan blythii. Blyth's tragopan belongs to the pheasant family Phasianidae. They are distributed in Bhutan, north-east India, Myanmar, Tibet and China. Their population is on the decline. It is estimated to be only about 10,000 birds. These birds prefers the undergrowth of evergreen oak and rhododendron forests. There are two subspecies and one of the subspecies, T. b. blythii, is found in the Himalayas of northeast India, southwest China and northern Myanmar. These species are largest among the genus. True to pheasants the males are brightly colored. The head is colored rusty red and the plumage is spotted with white dots. As in other members of the genus, the males have two pale blue horns. The females are dark brown with white mottling. They feed on insects, worms, seeds, berries, pods, fruits and buds. Current topic in Birds of India: Blyth's tragopan - Tragopan blythii. Home › Himalayan monal › Temminck's tragopan - Tragopan temminckii. The Temminck's tragopan (Tragopan temminckii) belongs to the pheasant family, Phasianidae and genus Tragopan. These birds are medium sized and are approximately 70 cm long, weighing about 1500 grams. They are distributed in the forests of East Himalayas, Peninsular India, northeast India, Tibet, north and central China, north Myanmar and north Vietnam. The male bird is slightly larger than the female. The stocky male has red-orange plumage with white spots all over. Its beak is black in color and the legs are pink. The female is dull brown in color. These birds feed on ferns, bamboo sprouts, mosses, berries, grass flowers, leaves, grass stalks, and plants. The International Union for the Conservation of Nature (IUCN) has classified them as of "Least Concern". Current topic in Birds of India: Temminck's tragopan - Tragopan temminckii. 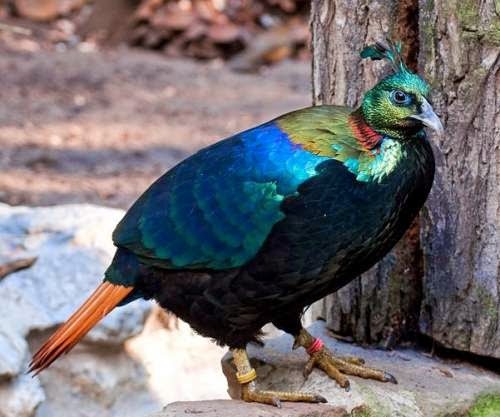 Home › Sclater's monal › Himalayan monal - Lophophorus impejanus. The Himalayan monal, also known as impeyan pheasant and danphe, belongs to the Phasianidae family. The monal is the national bird of Nepal as well as the state bird of Uttarakhand and Himachal Pradesh states of India. In Nepal it is known as danphe and in India it is known as monal. The natural range extends eastwards from eastern Afghanistan. In the Indian subcontinent it is seen in the temperate mountainous regions of Pakistan, India, Nepal and Bhutan. The male is slightly larger than the female. It is rather large in size and the male is about 70 centimeters long and weighs about 2000 grams. The male has multicoloured plumage with metallic green crest, coppery feathers on the back and neck. The female has a prominent white strip on the tail as well as a white patch on the throat. The International Union for the Conservation of Nature (IUCN) has listed the bird as of "Least Concern". Current topic in Birds of India: Himalayan monal - Lophophorus impejanus. 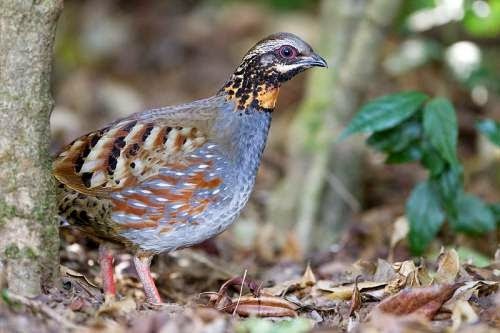 Home › Mountain bamboo-partridge › Rufous-throated partridge - Arborophila rufogularis. The rufous-throated partridge (Arborophila rufogularis) belongs to Phasianidae family. These birds are found in Indian subcontinent and Southeast Asia including India, Laos, Myanmar, Nepal, Bangladesh, Bhutan, China, Thailand, and Vietnam. Their natural habitat is moist lowland evergreen forest with thick undergrowth in subtropical or tropical montane regions. There is no sizable change in the bird population and they are listed by International Union for Conservation of Nature (IUCN) as of "least concern." They feeds on the insects, seeds, berries, shoots and invertebrates. A. r. rufogularis and A. r. intermedia are the two subspecies found in the foothills of himalayas. They have distinctive head and throat patterns. Current topic in Birds of India: Rufous-throated partridge bird - Arborophila rufogularis. Home › Red-necked grebe › Little grebe - Tachybaptus ruficollis. The little grebe (Tachybaptus ruficollis), also known as dabchick, belongs to the Podicipedidae (grebes) family of birds. Podicipedidae comprises six genera, and 22 species of grebes of which two are extinct. 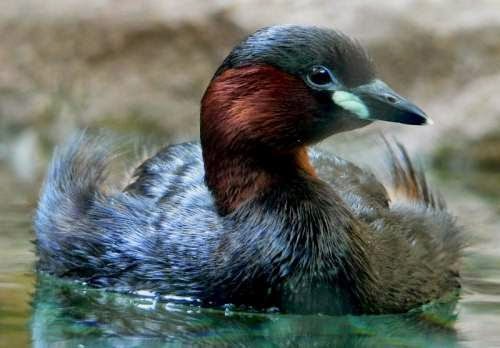 Measuring 25-29 cm in length and weighing 150-250 grams, little grebes are the smallest among the Podicipedidae family. Of the nine recognized subspecies, T. r. capensis is present in the Indian subcontinent, including India, Pakistan, Bangladesh and Sri Lanka. Another subspecies T. r. albescens is distributed in India, Sri Lanka and Myanmar. The habitat of these little birds include wide range of normally small and shallow ponds, wetlands, small lakes and canals. These birds feed mainly on insects, larvae, small fish, crustaceans, beetles and snails. In India,these birds are seen breeding in small colonies in the heavily vegetated areas of freshwater wetlands, lakes and ponds. In India, they nest on the water's edge, preferably among the thick vegetation. The nest has about five eggs. Soon after hatching the young ones leave the nest and start swimming. Sometimes the parents are seen carrying the young ones on their back. Current topic in Birds of India: Little grebe - Tachybaptus ruficollis. 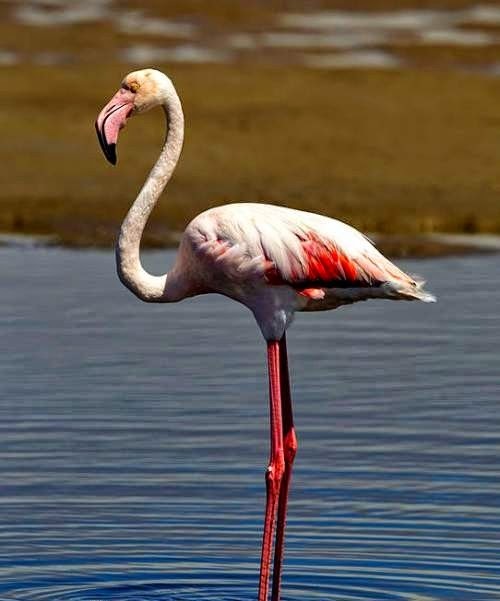 Home › Lesser flamingo › Greater flamingo - Phoenicopterus roseus. 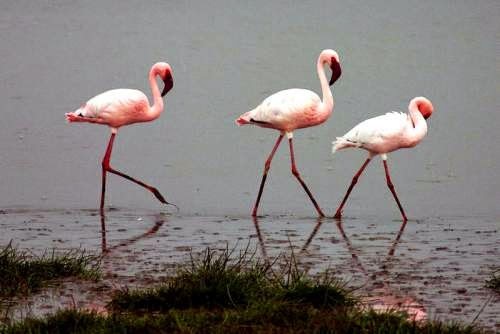 Home › Greater flamingo › Lesser flamingo - Phoenicopterus minor. Home › Grey junglefowl › Red junglefowl - Gallus gallus. The red junglefowl (Gallus gallus) belongs to the Phasianidae family. The red junglefowl are distributed in India, Nepal, Bhutan, Bangladesh, Myanmar, China, Laos, Vietnam and Indonesia. 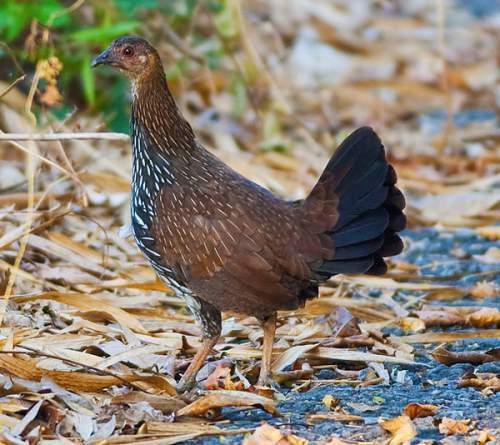 There are five recognized subspecies of these junglefowl. 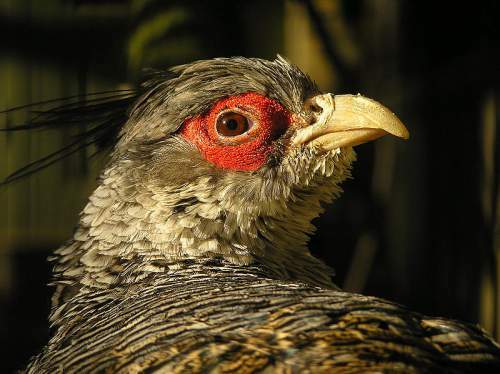 The subspecies G. g. murghi occurs in India, Nepal, Bhutan and Bangladesh. The subspecies G. g. spadiceus occurs in India, Myanmar and China. The subspecies G. g. jabouillei occurs in China, Laos and Vietnam. 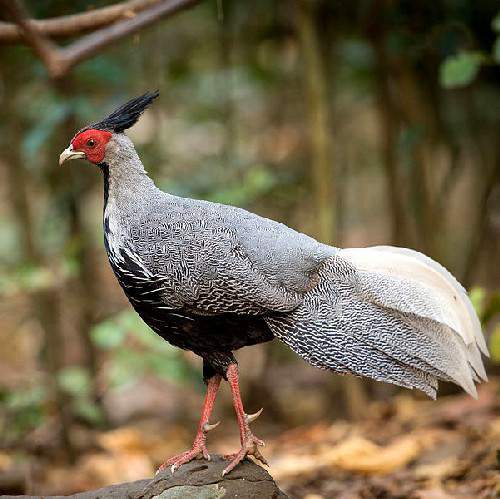 The subspecies G. g. gallus occurs in Thailand, Cambodia, Laos and Vietnam. The subspecies G. g. bankiva occurs in Indonesia. The male junglefowl is a medium sized colorful bird, measuring 65 to 80 cm in length and weighing 670 to 1450 grams. The female is smaller than the male and is 40 to 45 cm long and weighs 480 to 1000 grams. The males have large crimson fleshy wattles and comb on the head. The males have a spur on the leg, used for fighting other competing males. The tail has long arching glossy blackish feathers. 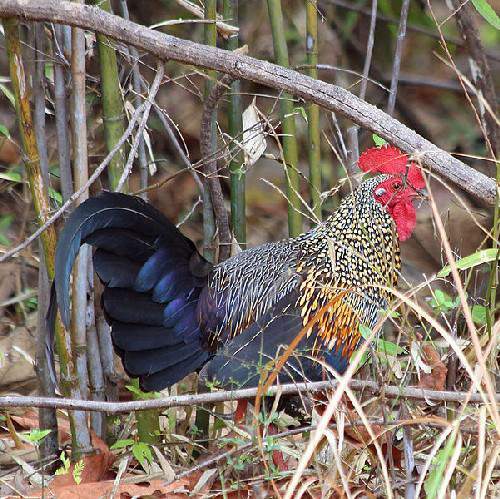 These junglefowl have an extensive range, inhabiting most of the habitats including mangroves. They feed on seed, small reptiles, insects and a variety of plant matter. They roost in the trees. They usually breed during March to May in the dry season. They are polygamous. They nest on the ground and the female bird incubates the eggs. The female junglefowl looks after the chicks. 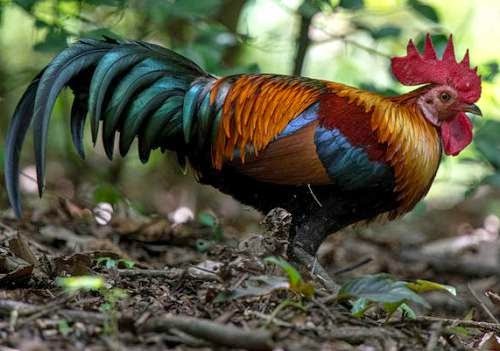 Current topic: Red junglefowl - Gallus gallus. Home › Kalij pheasant › Grey junglefowl - Gallus sonneratii. The Grey junglefowl (Gallus sonneratii), also known as Sonnerat's junglefowl belongs to the family Phasianidae. These species are endemic to India. These junglefowl are found in the Peninsular India, in the States of Gujarat, Rajasthan, Madhya Pradesh, Andhra Pradesh, Karnataka, Tamil nadu and Kerala. 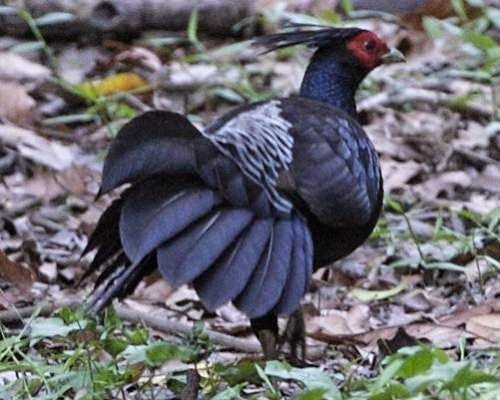 The International Union for Conservation of Nature (IUCN) had categorized and evaluated these junglefowl species and had listed them as of 'Least Concern'. The male Grey junglefowl are medium sized birds, measuring 70 to 80 cm in length and weighing 800 to 1100 grams. The females are smaller and measure 38 cm in length and weigh 700 to 800 grams. The male has red wattles and combs. Spurs are present in red colored legs in males. The females have yellow colored legs devoid of spurs. The central tail feathers in males are long, black and sickle shaped. 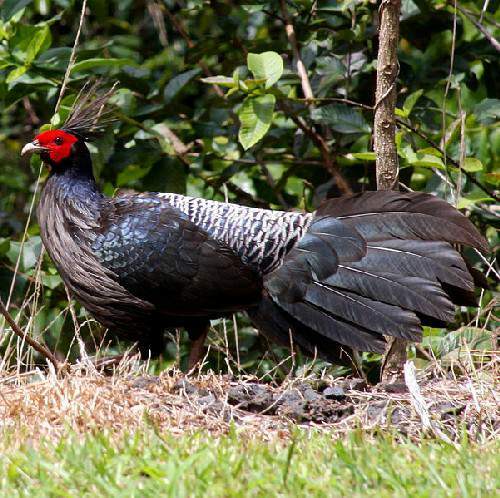 The Grey junglefowl inhabit thickets, forest floor covered with scrubs and evergreen forests. They feed on insects, small vertebrates, seeds, grass and berries. They breed throughout the year. The female incubates the eggs and take care of chicks. 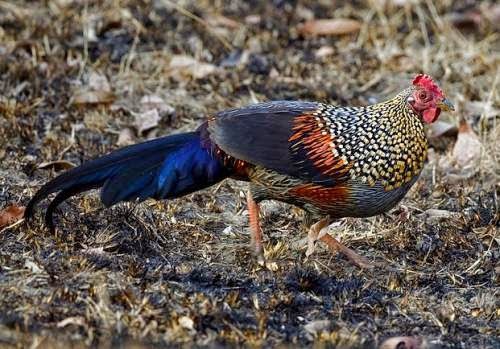 Current topic: Grey junglefowl - Gallus sonneratii. Home › White eared pheasant › Kalij pheasant - Lophura leucomelanos. 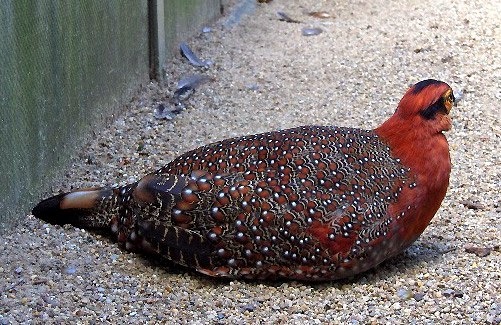 The kalij pheasant (Lophura leucomelanos), belongs to the family Phasianidae. 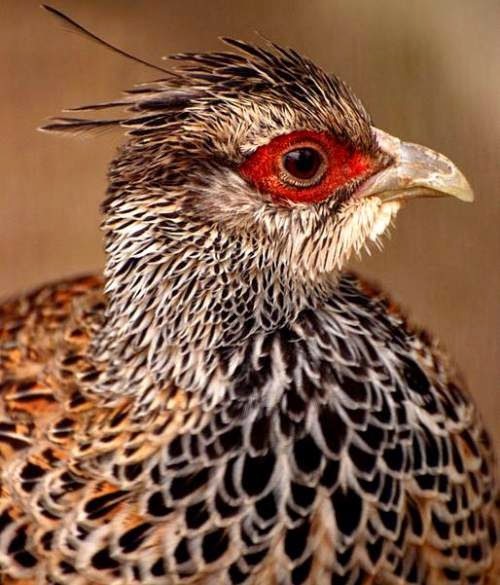 The kalij pheasants are distributed in foothills of Himalayas, India, Nepal, Bhutan, Myanmar and Thailand. There are nine subspecies of these pheasants. The subspecies L. l. hamiltonii occurs in India, Nepal and Pakistan. The subspecies L. l. leucomelanos is found in Nepal. L. l. melanota occurs in India, Bhutan and Nepal. The subspecies L. l. moffitti is found in Nepal. L. l. lathami occurs in Bangladesh, India, Bhutan, China and Myanmar. L. l. williamsi occurs in Myanmar and India. The subspecies L. l. oatesi occurs in Myanmar. L. l. lineata occurs in Myanmar and Thailand. The subspecies L. l. crawfurdii occurs in Myanmar and Thailand. The kalij pheasants are medium sized birds, males measuring 60 to 75 cm in length and weigh 800 to 1150 grams. The females are smaller measuring 50 to 60 cm in length and weigh 500 to 1000 grams. The males have glossy bluish black plumage and the females are brown. The bare facial skin is red in color. They inhabit evergreen and deciduous forests. They feed on roots, seeds, small reptiles, insects and forest yams. They breed during May and June. Current topic: Kalij pheasant - Lophura leucomelanos. Home › Cheer pheasant › White eared pheasant - Crossoptilon crossoptilon. The white eared pheasant (Crossoptilon crossoptilon) belongs to the family Phasianidae. The white eared pheasants are distributed in India and China. There four subspecies of these birds. The subspecies C. c. dolani Meyer occurs in China. The subspecies C. c. drouynii occurs in Tibet in China. The subspecies C. c. crossoptilon occurs in India and china. The subspecies C. c. lichiangense is also found in China. The International Union for Conservation of Nature (IUCN) had categorized and evaluated these pheasant species and had listed them as 'Vulnerable'. These birds are fairly large, male measuring 75 to 100 cm in length and weighing 2350 to 2750 grams. The tail of the males is nearly 50 cm long. The females are smaller than males and weigh between 1400 to 2000 grams. These birds are prominently whitish and white eared. The bare face skin is red. The tip of the tail and wing feathers are tipped black. They inhabit subalpine coniferous forests are seen in the elevations between 3500 to 4500 meters. They feed on tubers, bulbs, berries and wild onions. They breed during April to June and the clutch has four to six eggs. They are monogamous. 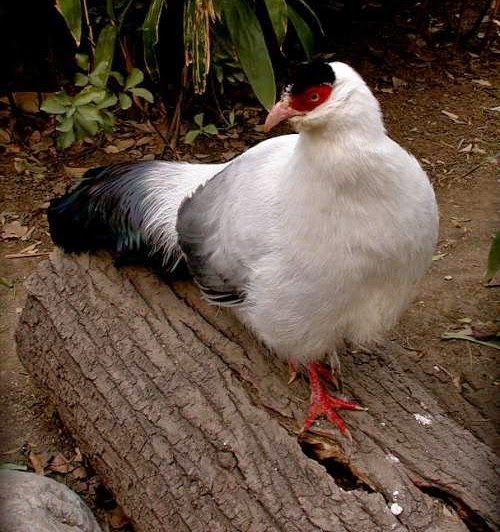 Current topic in Birds of India: White eared pheasant - Crossoptilon crossoptilon. 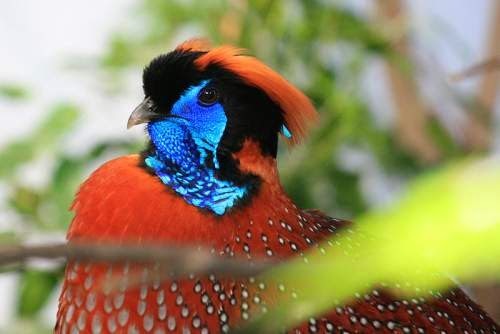 The cheer pheasant (Catreus wallichi) belongs to the family of Phasianidae. 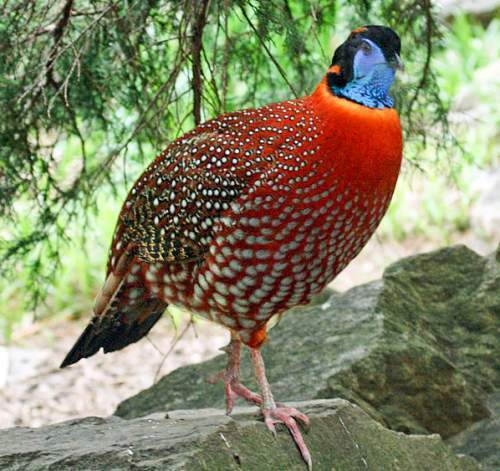 Cheer pheasants are only species under the genus Catreus. They are distributed in the Himalayan region of India, Pakistan and Nepal. In India these birds are found in the states of Uttarakhand, Himachal Pradesh and Jammu and Kashmir. Their distribution is patchy and pockets of small populations are recorded. There is population decline due habitat loss caused by human activities and also due to hunting. The International Union for the Conservation of Nature (IUCN) has categorized and evaluated these birds and listed them as "Vulnerable". The Catreus wallichi is a large bird measuring 90 to 120 cms in length and weighing 1250 to 1800 grams. The males are larger than the female birds. Their plumage is buff colored and the crest is grey. The male cheer pheasant has white breast plumage and both male and female have red facial skin. The Catreus wallichi have long tails of 18 elongated tail feathers. 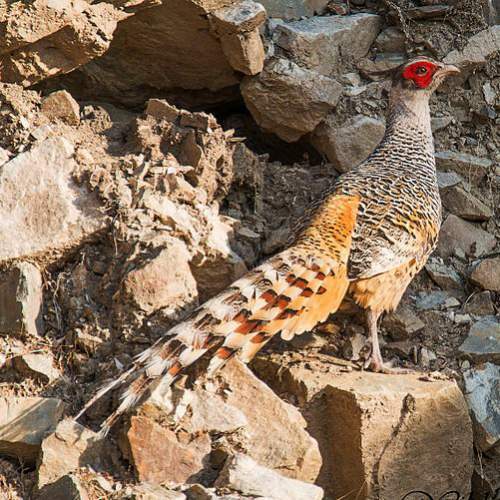 The cheer pheasants inhabit steep slopes, highlands and scrublands. They are found at an elevation of 6,000 feet and in summer they may go up to 10,000 feet. They feed on roots, tubers, bulbs, seeds, insects and worms. They breed during April-June and the nest has a clutch of 10 to 12 eggs. The males are monogamous. 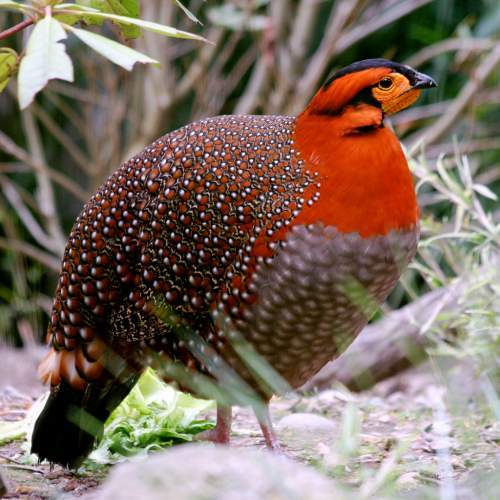 Current topic in Birds of India: Cheer pheasant - Catreus wallichi. Home › National bird of India › Indian Grebes › Grey peacock pheasant (Polyplectron bicalcaratum). Grey peacock pheasant (Polyplectron bicalcaratum) is also known as Burmese peacock pheasant. It belongs to the pheasant family, Phasianidae. It is the national bird of Myanmar. They are distributed in Northeast India, Bhutan, Myanmar, Bangladesh, Southwest China, Vietnam and Thailand. There are three recognized subspecies. The subspecies P. bicalcaratum bakeri occurs in the hilly regions of Northeast India, Bhutan and Myanmar. In India, they are found in Sikkim and Manipur. P. bicalcaratum bicalcaratum and P. bicalcaratum ghigii are the other two subspecies. The International Union for Conservation of Nature (IUCN) has evaluated and categorized these birds as of "Least Concern". These are fairly large birds with an elongated grey peahen-like tail. Polyplectron bicalcaratum species measure 60 to 80 cms in length and weigh 500 to 1000 grams in weight. Males are larger than the females. The plumage is greyish brown with greenish eyespots. These birds inhabit the dense green forests in the hilly areas. They feed on insects, worms, berries, fruits and seeds. Their breeding season is April-May. The males are believed to be monogamous. Current topic: Grey peacock pheasant - Polyplectron bicalcaratum. The National bird of India is peacock. The Government of India selected peacock (Pavo cristatus) as the national bird on 31, January, 1963 among several contenders such as the great Indian bustard, the sarus crane, the brahminy kite and the swan. The great bustard was the close contender for the national symbol. Since the Tokyo conference of the International Council for Bird Preservation held in May 1960, the subject of choosing an avian symbol was under active consideration. Indian Board for Wildlife was given the task of selecting the national bird, after giving due consideration to the views of the states. The selection was done after consultation with the state governments and the public opinions expressed in the press. They are very graceful with beautiful shimmering colors. Further they are found throughout the country. They are protected under the Indian Wildlife (Protection) Act, 1972. It is noteworthy to mention that Burma had green peacock as its national bird. The blue peacock (male) has a long slender glistening neck, glossy blue breast and blue and green-bronze feathers. The male has a fan-shaped crest of feathers and a white patch under the eye. The trailing tail is long with about 200 elongated feathers. The males dance by fanning out the tail and shaking feathers. The peahen (female) is slightly smaller than the male, brownish in color and lack the long trailing tail. This national symbol is seen in the deciduous forest, feeding on the forest floor. It feed on seeds, grains, berries, insects, snakes, lizards and small mammals. It spends the night perched on tree branches, protecting itself from the predators. Current topic:Indian peacock - National bird of India.